Watering and fertilizing are important, but without core aeration, they can only do so much. The fact is, your neighbor who has a deep, vibrant, green lawn likely has it aerated twice a year. Lawn plug aeration is a service where workers use a specialized machine to create deep but small holes in your lawn. You might have seen yards where plugs of grass and soil are sitting all over the lawn, which is from aeration. While at first impression this might appear to hurt rather than help your grass, it’s actually an extremely healthy practice. One of the main things aeration helps with is soil compaction. Over time, the soil where your grass is planted can be compacted down, making it difficult for water and nutrients from fertilizer to penetrate the root system. High traffic: kids, pets, and even adults walking, running, and playing on grass. Construction: driving heavy machinery over ground will compact the soil, even if you till it and lay fresh sod down. Sod: even laying down sod can contribute to this problem, because the soil under it is much harder. Clay soil: by nature, this type of soil compacts as time wears on. Not only is a soil compaction a problem, but so is thatch. This layer will create a barrier over the soil, making it difficult for anything to get through. 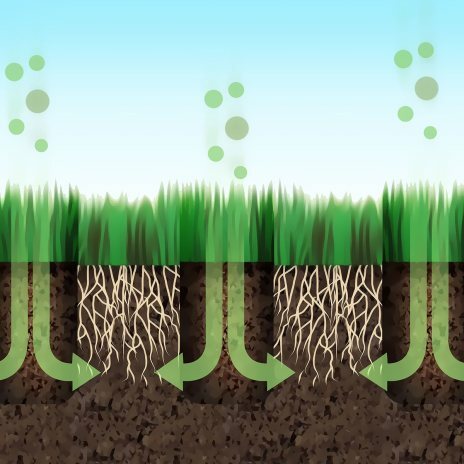 Aeration creates a way for water and fertilizer to reach the grassroots, strengthening them. In addition, it allows air to flow to the roots, providing much-needed oxygen at higher levels. This encourages the roots to grow deeper, making your lawn healthier in the process. Your lawn will look greener and fuller. You won’t need to water as much since it will soak into the ground more effectively. Your lawn will feel soft, but not spongy, making it perfect for playing or hosting gatherings. The grass will deal with extreme weather, including intense heat and cold, better than before. Of course, these are all signs of a healthy lawn, because that’s the ultimate result of aeration. You should have aeration done on your lawn both in the spring and fall to see the full benefits. 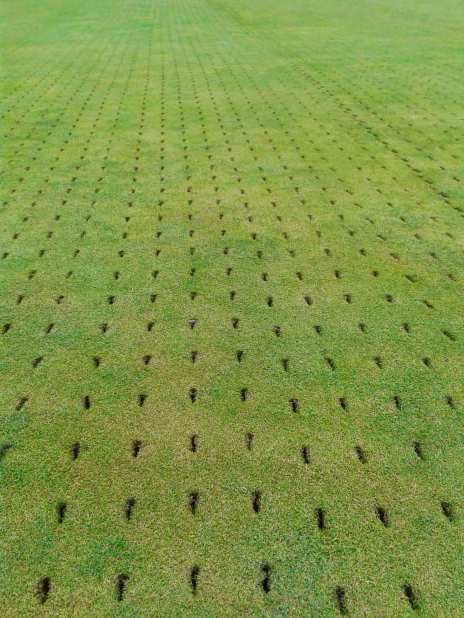 Contact Gro Lawn to get a professional team to your yard, where we can perform aeration with expertise and care.